I recently purchased Rimmel Lasting Finish by Kate Moss lipstick 107, Rimmel Lasting Finish Lipstick 077 Asia , Rimmel Stay Matte Powder and an Essence Lipgloss from Nykaa during Rimmel's 50% off Sale. I was glad that I purchased them, since I was dying to try Rimmel products since a very long time. The Rimmel Lasting Finish Lipstick comes in a black packaging with a slanted cap. The cap has Rimmel's pretty logo. I find that the cap is very loose and does not close securely, maybe this is the problem with only my product. I feel these lipsticks are not travel friendly, since they can melt off in this summer and the caps are not secure as well. I feel like the Rimmel Lasting Finish by Kate Moss Lipstick is more intense and long lasting than the Rimmel lasting finish lipstick. 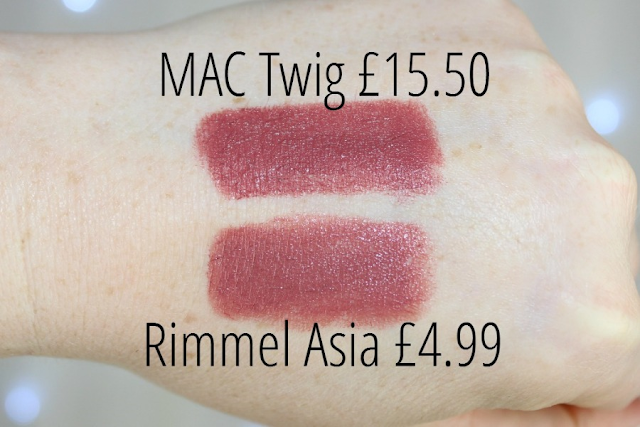 Rimmel Lasting Finish by Kate Moss Lipstick 107 is a deep berry red shade that has blue undertones to it. It is creamy but less creamier than the lasting finish lipstick. It gives opaque payoff in one swipe. This kind of shade will suit simply all skin tones. I feel like the Rimmel Lasting Finish By Kate Moss lipstick is long lasting than the Rimmel Lasting Finish Lipstick. The Kate Moss lipstick lasted for about 4-5 hours straight, whereas the Lasting Finish Lipstick lasted for 3-4 hours. The Rimmel Lasting Finish By Kate Moss lipstick has somewhat a powdery finish to it, which is quite moisturizing as well. Both of them are comfortable on the lips. Both of these lipsticks are sadly not transfer proof. Considering the price point and the performance, I do recommend them.